A sombre and moving portrayal of outbound Avro Lancasters at sunset over the North Norfolk coast being overtaken by a target-bound Pathfinder Force Mosquito. 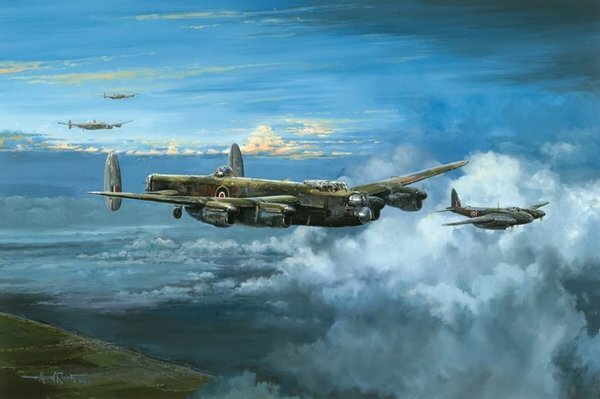 The Lancaster portrayed is VN-B of No.50 Squadron, RAF Skellingthorpe, flown by Michael Beetham with his crew during the height of the bomber offensive from 1943-1944, including 10 missions to Berlin. Signatures: Marshal of the Royal Air Force Sir Michael Beetham GCB CBE DFC AFC. President of the RAF Bomber Command Association. Flight Lieutenant Mervyn Ingmire DFC. 115 & 83(PFF) Squadron.